Sewing came later in life for Pam Heyna. Marriage (Bill), Motherhood (Misty) and a long-term career (Winn-Dixie) kept Pam's life full. However, in the 90's, Pam left her job and decided to learn how to sew. At her first sewing class, she used an old machine which was too embarrassingly loud to have in a classroom. Her father, wanting to support his only child's new venture, gifted her $300, feeling that this amount would undoubtedly suffice for a top-of-the-line machine. Not wanting to dampen her father's spirit of support, Pam and Bill secretly spent at least one dollar more and bought Pam's first machine, a Pfaff 7570 sewing and embroidery machine. Wow! The pilot now had a plane, and oh! the places she would go! Machine Embroidery was in its infancy then, and Pam (as always) put her whole heart into it. Three craft shows later, the machine cost had been recouped, and Pam's skill and confidence soared! The country's leading machine embroidery competition (Machine Embroidery Enthusiast Convention) was held in Las Vegas, Nevada. With her first entry, Pam won 1st place in 1999, then returned the next two years to win 2nd and 3rd places, respectively. In 2005, Pam became a grandmother to a high-risk premature grandson, Shane. Once Shane left the hospital, and Misty returned to work, Pam became Shane's primary daytime caretaker for his first year. Her efforts paid off, as Shane thrived. By the middle of 2006, Shane was caught up enough to enter a regular daycare, and suddenly Pam dove into another new interest: Quilting! Pam's second 'mother', Dotty helped Pam in her early quilting endeavors--first introducing her to those long-forgotten tools, the iron and ironing board! Like many, Pam didn't use an iron anymore. Wow! How quilting changed that! In 2007 Pam joined the Mount Washington Quilting Bees, (MWQB), her local quilt guild. She learned enthusiastically from her "Sew Sisters" and before long was teaching classes herself. Within a few years, she found herself voted President of the Guild, and bravely started entering the KY State Fair quilt competitions. Her father lived to see some of her entries/ribbons and was sooo proud! Wanting a prestigious quilt venue in the Louisville area that would showcase a judged quilt show, world renowned instructors and vendors, Pam worked hard with the MWQB to sell guild cookbooks for seed money. The Bluegrass Quilt Festival, an annual three-day event, was started with the MWQB's backing. Pam was co-owner throughout its 2011-2014 lifetime. Pam also worked with the Bullitt County Barn Quilt Trail, drafting and painting, painting, painting! Every year, Pam becomes more prolific in her quilt making. She started winning blue ribbons at the KY State Fair, then "BAM!" she took Best of Show Bed Quilt at the 2013 Bluegrass Quilt Festival. What a Thrill! Not as exciting getting a new grandson, Gavin, the same year, but still so wonderful. Averaging seven quilts a year, Pam shines in precision, speed, and balance in her quilt making. Her husband, Bill, is her biggest fan, and Chloe, her yorkie, has clocked almost as many hours in the STUDIO as Pam. 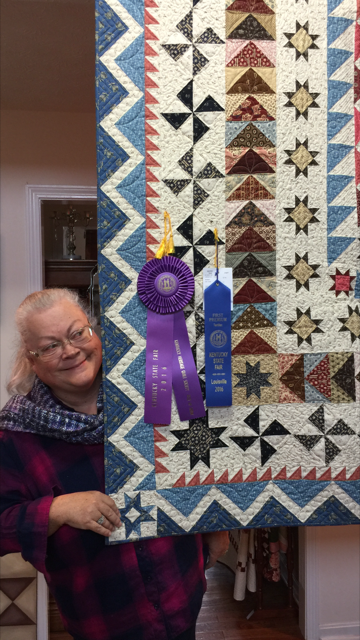 And it all paid off in 2016, she won her highest quilt honor yet--BEST OF SHOW in the KY State Fair Quilt Competition with her quilt, OHIO VALLEY MUSINGS! What an accomplishment! The taste of victory is sweet, and no doubt, for Pam, this is just the beginning!